On Wednesday, November 28th, the English 2 classes at CCHS took a field trip to see Life of Pi after reading the novel in class. 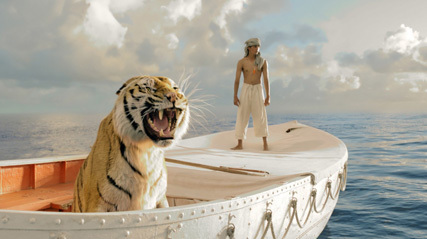 Life of Pi premiered November 21st, getting 4 stars and many great reviews. The book, written by author Yann Martel, features a young boy and his family moving from India to Canada. The boat that they were traveling on sinks, and Pi is left at sea in a lifeboat with a tiger as his only companion. The story tells of his 227 days at sea and his struggles with both the elements and the tiger. The sophomore class, along with the English 2 teachers, watched the 10:00am showing at Cinemark Theater. The money paid by each student accounted for food as well as a ticket for the two-hour show. The field trip was to show 10th grade students a visual representation of the novel, which most had to read and analyze. The story provided insight on several topics discussed in the class, and was a great way for the kids to fully understand the novel and its theme. “It was interesting seeing a different interpretation of the book,” sophomore Rebekah Suissa said.